The last three stages are repeated at regular intervals as search results improve. Each step in the process is explained below. Every internet reputation management campaign begins with a thorough research phase. First, we identify the subject’s (that’s you or your company) top search phrases. These might include variations on names, key titles or services, and other phrases that searchers readily associate with you. Will Google or the publisher remove content? As mentioned above, part of the ORM process is to decide whether something can be removed from either the website it lives upon, or from search engines like Google. If it makes sense, we look at legal solutions such as DMCA take-down requests and other legal methods. If we do employ legal reputation solutions we will often do it simultaneously with suppression or protection campaigns. Other removal tactics may include YouTube video removal, NoIndex removal, removing search results from Google, and other techniques. After identifying similar people and/or companies to yours, we conduct a thorough analysis of their search results. For example, if the project is for mortgage company reputation management we identify a number of other similar companies. Then look at their search results in different locations similar to yours. We find commonalities between them that are revealed as patterns. Then use these patterns to inform our next steps. We then conduct a gap analysis, drawing out key differences between their results and yours. 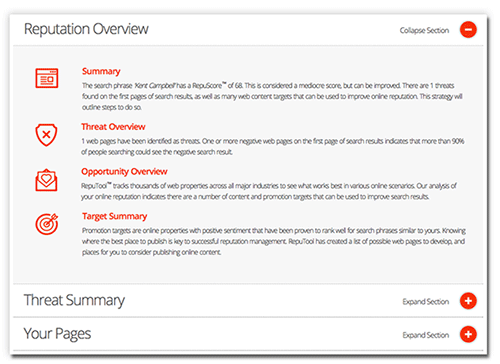 The gap analysis illuminates potential reputation threats and opportunities. With the results of our gap analysis in hand, we draw up a list of controllable web properties to develop with content that portrays you in a positive light and draws organic traffic, shares and those all-important inbound links. The internet reputation development plan plays a big part in us knowing how to sculpt the ‘perfect’ search results page that people and search engines both appreciate. Separately and simultaneously, we conduct social influencer and influencer research to identify industry-specific people and trends critical to internet reputation management within your market. These will be used later during the Promotion phase. All of the above inform our reputation management strategy that guides the rest of the process. With these in place, we set up a network of owned domains to enable us to distribute content that will later be developed to each of your web properties. Once we understand the challenges and opportunities associated with your online brand we brainstorm content ideas designed to appeal to the kinds of people who may consume your content. At this point we’ve reduced these people to a representation called a "persona" that enables us to visualize and empathize with that archetypical person. We lay out basic content outlines and subjects for your approval and feedback. Often we’ll request new ideas and feedback on the ones we’ve already come up with. Not all content is created by Reputation X. When relevant, online review management techniques are used to drive real customers to the review sites most likely to positively affect online sentiment through star-ratings and reviews. You can learn more about review management here. Based on the amount and frequency of content we create, we devise a publishing plan that keeps your reputation management trains running on time. This schedules content publication across many of your content channels, from posts on owned websites and blogs to articles on third-party sites and deployment to authoritative sites. We often use a combination of manual and automatic publishing systems. That way timed content can be deployed according to a schedule, but trending timely content can be created and published on short notice. Types of content published include blog posts, guest posts, press releases, tweets, Facebook posts, Google plus posts, industry articles, video, slideshows, images and other special content designed and developed according to the projects needs. Reach out to the reader base on properties you own and control. Because we can control these properties to a high degree, we work to get as many owned properties into search and social results as possible. We use social media and to solicit comments, feedback, shares and links to created content—whether by asking directly or by creating engaging content that naturally draws these forms of promotion. During some campaigns we interface with third-party PR agencies to perform public outreach. Click to learn the difference between PR and ORM. Done right, paid promotion can have high ROI. Powerful forms include guest posts on relevant, high-authority websites and blogs, paid discovery using tools, sponsored content on high-authority media websites and paid search campaigns. Retargeting is simply watching results to see what has worked, then changing the way the content marketing and SEO program is focused so inertia continues and search results improve. SEO reputation management includes researching appropriate link partners, SEO outreach, link development, on-page and off-page technical optimization, and more. For more information about a typical search engine optimization campaign click here. Seeking out an experienced online reputation management services company and committing to an improved online image won’t produce changes overnight. ORM is a long game, a painstaking process marked by victories both large and small. We hope this article has given you a high-level understanding of what a comprehensive process for managing a brand's reputation online is all about.